A Slice of Smith Life: Yummy and Festive 4th of July Cake! Tonight we had a 4th July celebration with my family and friends at my in-laws house. We ate some delicious hot dogs, marched to some patriotic music while holding flags, had our traditional wiffle ball game, and then shot off some firecrackers. It was a fun night to celebrate our great country! I wanted to share a great cake recipe that I made for the first time for our gathering tonight. My mom passed on the recipe to me and it's as delicious as it is festive for any 4th of July gathering! So if you need a great festive cake for this 4th of July, give this one a try! It was a hit with family and friends tonight and I will definitely be baking this great dessert again! 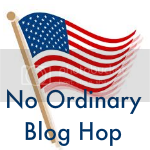 Join the crew at No Ordinary Blog Hop! Anything with strawberries and cool whip always looks so refreshing and yummy!! Yum! I am going to try this... it won't be for the 4th since it is now the 5th! :) But, it sounds delicious and just looks like a nice summer dessert. I made a blueberry cobbler with fresh blueberries from my step-mother's yard. Delicious. God bless! Happy belated 4th! P.S. It sounds so weird to me, Tracy, to say my step-mother's yard instead of Daddy's. The kids and I decorated his grave with red, white, and blue carnations and an American flag. He was a veteran and a very proud American. Well, I reread my first comment, and it just felt wrong and sad not to say Daddy's yard! I suppose it will get easier. Have a great week! Thanks Renee Ann! :) Hope you had a great 4th! Yes, strawberries and cool whip is always a hit :) Thanks for stopping by! Thanks for stopping by and commenting! I loved re-visiting your blog today. It's so inspiring and I love all your Catholic recipes and crafts! Thanks for the links! Hope you had a blessed 4th! I hope you get to try out this dessert! Let me know how you like it if you do :) A homemade blueberry cobbler sounds great! That is so nice that you were able to spend time in your Daddy's garden and spend the time to decorate his grave. I bet it looked beautiful and he is smiling down on you, his loving and thoughtful daughter and family. It sounds like you have such wonderful memories to keep your father's love and spirit alive. May God continue to give you peace and comfort as you remember him daily. God bless Annita!